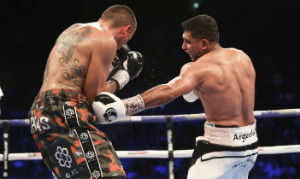 Amir Khan recently returned to the big leagues with a win against Samuel Vargas, which seems to be in line with the boxer’s pre-hiatus aspirations of making it big in Pay-Per-View. PPV boxing fights have been going through the roof, with Floyd Mayweather Jr. being the king of the modern times with an average of around 4.5 million subscribers in his bouts against Manny Pacquiao and Conor McGregor. Khan was inspired by the PPV ratings of the Mayweather-Pacquiao fight in 2015, which reeled in close to $500 Million, the biggest prize money for any such event. Khan had set up his fights to land a PPV slot himself, but the catastrophic loss against Saul ‘Canelo’ Alvarez in early 2016 led to a massive setback to his ambitions. Khan moved up two weight divisions into the Middleweight class, in order to present a more exciting and fun prospect in his PPV bid, but the disastrous knockout loss left him out of the ring for the best part of two years. Khan is indeed an exciting prospect for PPV, as his fast hands and great style contributes to a fascinating watch for boxing fans. However, his recent form does not suggest that he has the same entertainment quotient as his peers and foes. The win against Vargas took the ‘King’ twelve rounds, after surviving a scare in the second round. Initially, Khan looked to have the upper hand by knocking down Vargas, but moments later, he tasted the floor as well, which have put a huge dent on any aspirations to win by a KO. Up until the hiatus, Amir Khan was certainly on course to becoming a PPV superstar, but he needs to build up his image to regain the popularity that he once enjoyed. Fans would certainly love to see the superstar regaining his mojo and landing a substantial Pay-Per-View bout against his arch rivals, but there are several questions surrounding his fitness and the ability to hold on his own inside the ring. Khan is undoubtedly looking to land a big fight that makes financial sense, and it does seem that he is back on track to achieve his dreams. 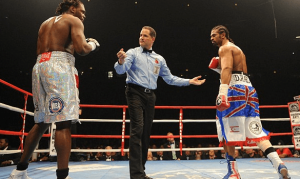 The former light-welterweight world champion and 2004 Olympic Silver medallist won his boxing bout against Samuel Vargas through a unanimous decision from the judges. The fight went well into 12 rounds, with the final points’ tally of 119-108, 119-109, and 118-110 yielding a comfortable victory for Khan. Although Amir has won the elimination round for his chance at the WBA title against current welterweight titleholder Manny Pacquiao, it was far from a straightforward night for the 31-year old. Khan was expected to have an easy win over Samuel, but it seemed that the British boxing champion was out of sorts after his early mistake that landed him on the floor in the second round. Khan maintains his impeccable record of 33 wins and only 4 losses in a career that spans 13 years. The boxing match at the NEC Birmingham Arena was a close testament to the life and struggles of the athlete inside the ring, where his supreme talents and fantastic hand speed were always overshadowed by several weaknesses. However, the two-year hiatus after his fight with Saul ‘Canelo’ Alvarez, which resulted in a vicious knockout, had indeed played a vital role in Khan’s performance against Vargas. Khan has indeed admitted that he needs to improve, especially if he fancies a chance to take the top honours at the WBC title fight, alongside the massive purse. Pacquiao may not be as easy an opponent as Vargas, and Khan is aware that he needs to take a good look at his fighting style to eradicate any shortcomings. Khan may also be tempted to call out on his opponent Kell Brook, how has been trying to schedule a fight for a long time. Kell Brook was present ringside during the Khan-Vargas fight and would have certainly fancied his chances after seeing the champion on the floor in Round 2. Amir Khan has promised to return to the ring to be a champion, but the boxer is also looking at the financial viability of his future fights. Therefore, it does seem that he might be into the twilight stage of an illustrious career, but he may not hang up his gloves just yet. There are lots of great gifts out there for a boyfriend, but buying an experience can be much more satisfying than buying a product when it comes to a present. People who are looking to surprise their boyfriends on their birthdays should take them to a boxing fight. If this is an important birthday, like his thirtieth birthday, doing something memorable is going to be even more important. Few outings are going to be as memorable as a boxing fight for anyone, even if both members of a give couple don’t like boxing. Some people would argue that buying people experiences isn’t as good as buying them products, since the products are going to last longer than the experiences technically. However, it should be noted that a lot of people will get tired of the physical gifts and products that they get, so the gift value isn’t really going to last forever. Lots of people who buy things get tired of them almost immediately after purchasing them, so it makes more sense to create positive memories and experiences rather than just buying things for someone else. Lots of busy couples will feel that they don’t spend enough time together, which is something that they can solve by doing more things outside with one another. Taking your boyfriend to a boxing fight is going to qualify as doing something genuinely exciting together outside. Lots of couples end up in a pattern where they go to restaurants and other places like that frequently, but all of those outings can blur together after a while. A boxing match is exciting enough that it is going to stand out in the memories of all couples. Watching boxing matches can provide a strong catharsis for everyone who is watching, given the emotional aspect of a fight. Couples will remember occasions like this forever. Amir Khan is a 29-years-old British boxer, born in England, who is currently holding the title of WBC Silver Welterweight title; he has boxed at three different weight classes such as lightweight, welterweight, and light welterweight. Khan started boxing when he was 8 years of age; his father was the individual who introduced him to the boxing gym that he first attended. His inspiration is not only the members of his family and his religion, but also his past heroes of sport; Khan’s main sport inspiration is Mohammad Ali. Khan’s first three fights were with the Bolton Boxing Club and Bury Boxing club in he was coached by Mick Jelly. At just the age of 16, Amir Khan began to achieve great success. He had won 6 different championships as well as a gold medal in junior Olympics and the European Student Championships. After attending the Athens Olympics in 2004, Khan decided to take his boxing abilities and turn them into a professional career. Since this, he has achieved the title of world champion twice. Aside from his championships and gold medals, Khan has had a successful career and has won against many opponents in each weight class. Of all fights in his professional career, which is 34, Khan has women 31 and lost 3. In his amateur days, one of Khan’s biggest fights was against Victor Ortiz; some other individuals he has beat include Chris Algieri, Jackson Williams, David Baley, Mohammed Medjadi, and many more. As stated above, Amir Khan has only lost three matches in his professional boxing career. His losses were against Danny Garcia, Lamont Peterson, and Breidis Prescott. 2 of his losses were due to knockouts. In addition to his wins, Khan was also nominated, in 2005, for the Laureus World Sports Award for Breakthrough of the Year, BBC Sports Personality of the in 2011, as well as Best as Sport award in 2013 at the British Muslim Awards. He has also received honorary degrees for his contributions to both charities and sports.